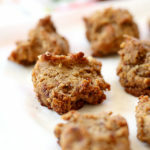 Peanut butter oatmeal cookies are slightly sweet and convenient for busy afternoons or mornings. 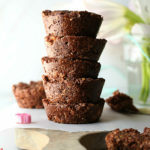 A delicious chewy baked good made with coconut oil and packed with oats for heart health! Every time we walk into the grocery store my little munchkins gravitate to any and everything starting with the letter C. Cookies. Crunchy. Carbohydrates. At that point there is a giant flash before my eyes of them running directly to a sugary sweet object which then is grabbed and chucked into the shopping cart like LeBron James shooting the winning shot! I end up leaving the grocery store and coming home with tons of items I did not even notice, if not careful. In the past, as I unload the groceries it has been four containers of Trader Joe’s crushers, 2 extra loaves of bread, oatmeal cookies (they really love cookies so we try to always make them healthy at home), and a package of dark chocolate peanut butter cups to name a few. I think after 5 years of having children I am slowly getting wiser at my shopping abilities. Plus my reflexes to get the extras out of the shopping cart are growing stronger everyday:-). After our wild grocery shopping experiences that always ends up looking like a mama tiger with her cubs bouncing off carts roaring at every object that passes by, we come home to make snacks. Now comes the fun part. We unload groceries to make homemade peanut butter cookies and our comes peanut butter powder, rolled oats, coconut oil, cinnamon, almonds and eggs and all they want to do is throw the eggs at each other! That being said, that is one scenario of how Delightful Mom gets baking done. The other scenario is I secretly break the eggs into the bowl first then turning around to find two boys taking handfuls of oats and scooping it directly into their mouths with a whole lot of cleanup left for me all over the floor. Ahhh, the joys of baking with boys! 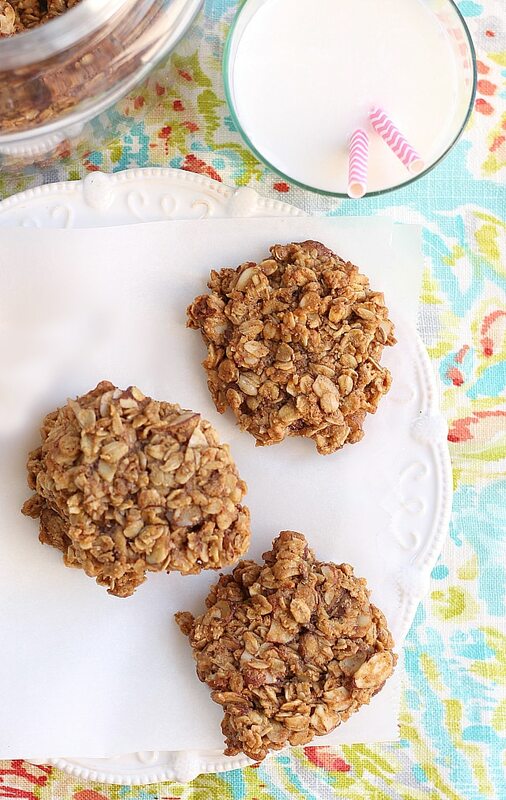 Luckily these easy peanut butter oatmeal cookies take little time to mix up! So how much trouble could they really get into, right?! Oats help cut asthma in children. Oats aid to reducing cholesterol and blunting glycemic and insulin response. Oats contain help boost immunity with beta glucans which boost defenses of the immune system against bacteria, viruses, fungi, and parasites. Oats can help reduce the risk of type 2 Diabetes. 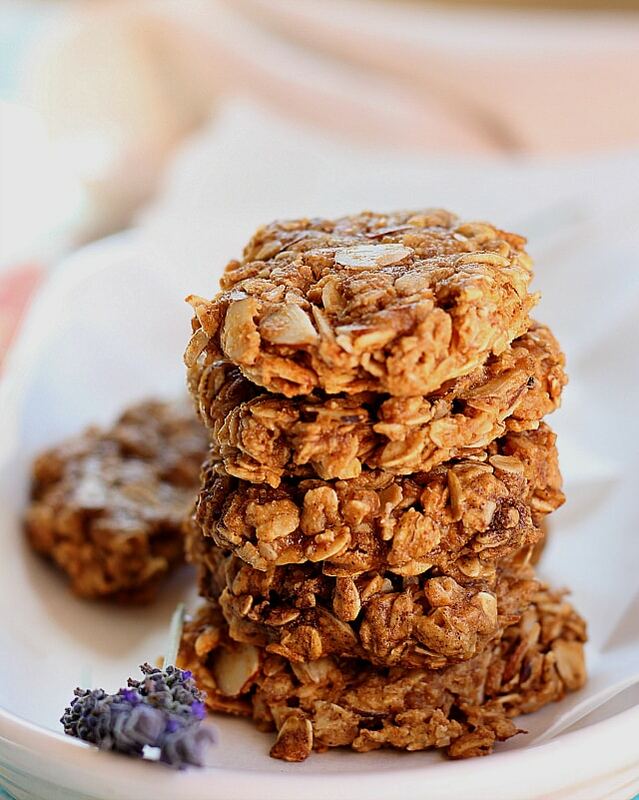 I made these healthy peanut butter oatmeal cookies a couple of weeks ago and am probably on my 6th batch already! We eat these all the time and the boys just love them for snacks, dessert and breakfast. We celebrated Chase’s 5th birthday party last weekend. 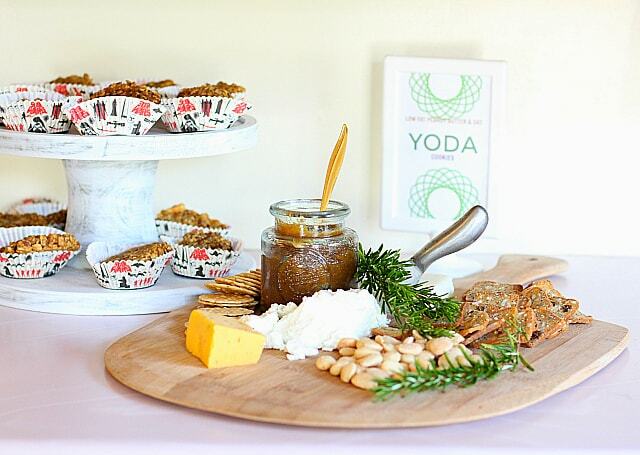 It was star wars theme and these chewy “Yoda Treats” were a really bit hit! The rest of the week my husband has been taking them in the mornings to work and just raves how scrumptious they are! 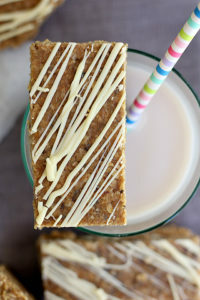 I eat 2-3 of these incredibly soft oatmeal cookies each morning and have been for the past two weeks and feel full until lunch. I workout each morning after breakfast and school drop-off and am full until lunch. I have a protein shake after my workouts which are only about 150 calories, but I am not really hungry for it. My post workout protein shakes are just to help with building muscle and nutrients that have been depleted during weight lifting. 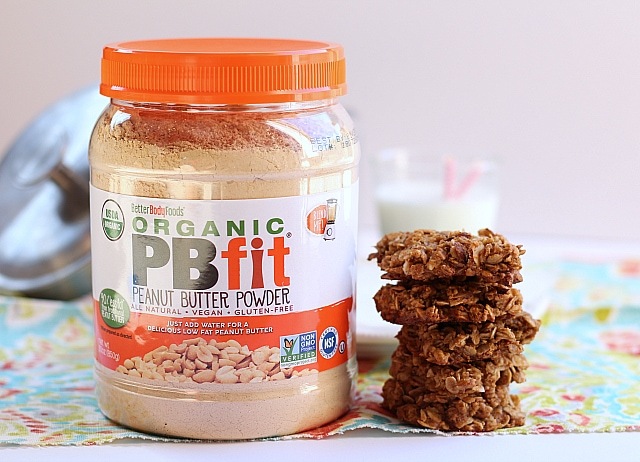 To keep the fat content lower in peanut butter oatmeal cookies use Organic PBfit Peanut Butter Powder which is all natural, vegan, gluten free and low in fat! To hold the cookies together I use coconut oil and let the dough set for a couple of hours to moisten the oats. This process also allows the coconut oil to harden making the dough easier to roll into balls. 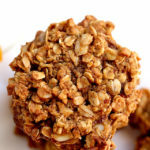 Once the dough has hardened roll it into 2-inch balls then smash them down using the palm of your hand keeping each peanut butter oatmeal cookie about 1 inch apart. 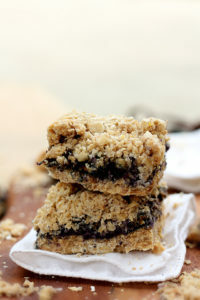 Bake for 8-10 minutes and flatten with the spatula right after the peanut butter oatmeal cookies come out of the oven. 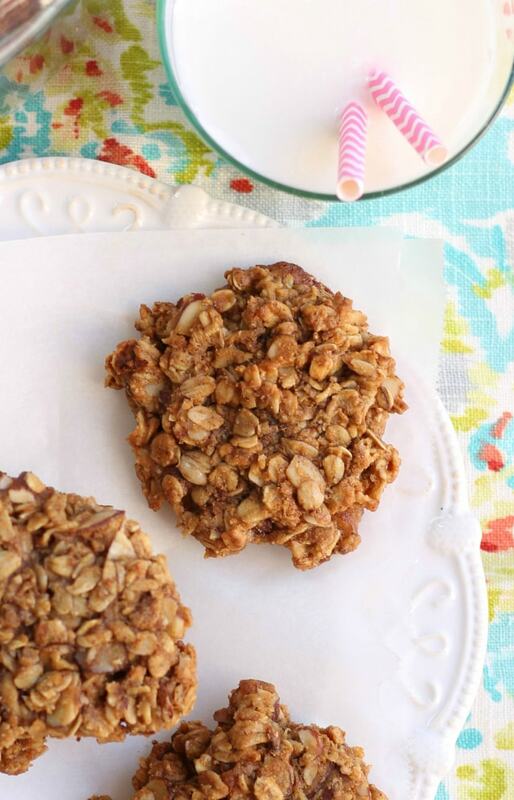 If you want to add raisins and turn them into peanut butter oatmeal raisin cookies go for it! If my boys see the sight of a shriveled grape in their cookie I am doomed for success:-). Or add some chocolate! Preheat the oven to 350 Degrees F. Prepare a baking sheet by lining it with parchment paper or silicone mat. In a small mixing bowl add the eggs, vanilla and maple syrup and mix until it is combined. In a large mixing bowl add the oats, gluten-free flour, peanut butter powder, almond slivers, cinnamon, salt, baking soda and coconut oil. Mix well then add the combined eggs, vanilla and maple syrup mixture and mix until the oats are completely moist and coated. Cover and let it set in the refrigerator for about 1 hour so the moisture soaks into the oats and the oil hardens. Once the dough has hardened roll it into 2-inch balls and place them on the prepared baking sheet about 1 inch apart. 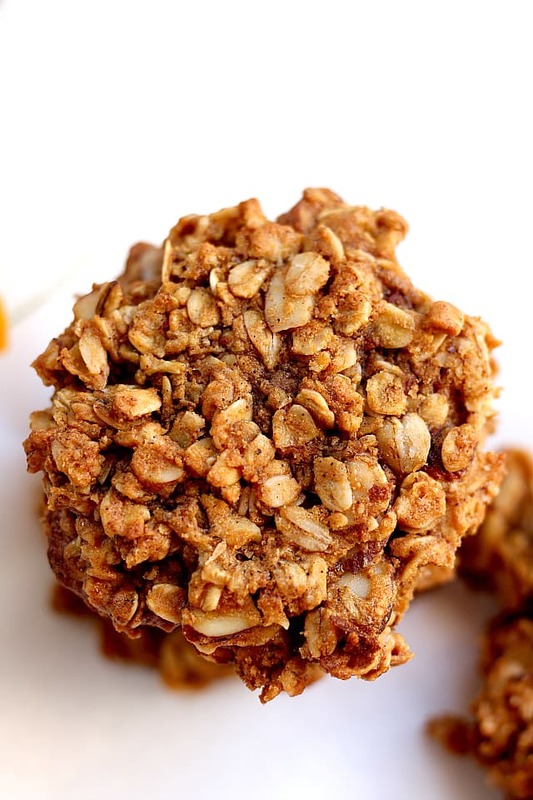 Then smash them down using the palm of your hand keeping each peanut butter oatmeal cookie about 1 inch apart still. 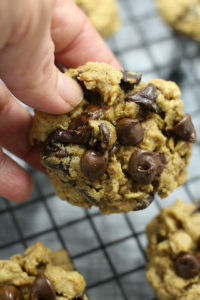 Bake for 8-10 minutes and after they finish cooking immediately flatten with the spatula right after the peanut butter oatmeal cookies come out of the oven (to form a patty). Let cool 10 minutes before moving to a cooling rack to cool completely.